The strong gushes of water cascading down the mountains and rolling slopes are sights to behold. Situtated in the lush green surroundings of Goa are numerous spectacular waterfalls that will inspire you to pack your bags and go see them for yourself. Photography fanatics will be particularly happy: the waterfalls we’ve listed below offer classic nature shots. On the Goa-Karnataka border on the River Mandovi, Dudhsagar Falls (literally “Sea of Milk”) are a sight to behold. They are one of India’s tallest waterfalls, at 310 meters high, and the largest in Goa. 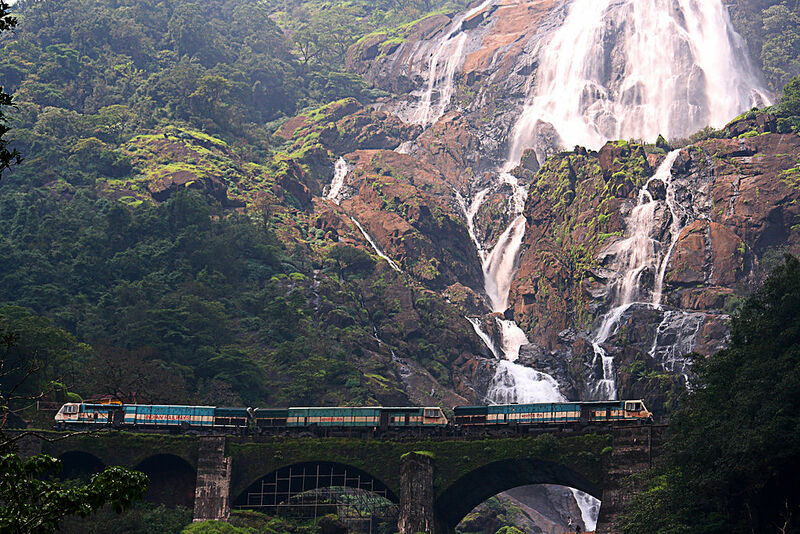 You can get up close to the Dudhsagar Falls by trekking there. The four-tiered waterfall is at its best during the monsoons. Fun fact: This place was used in one of the scenes in Shahrukh Khan and Deepika Pudokone’s Chennai Express. Located in the Western Ghats of Chorla, Sada Falls is a beautiful waterfall that lies eight kilometres from a small village. The most amazing feature of Sada Falls is its shape and view, as it flows between two hills and then widens into an awe-inspiring cascade. The perfect way to experience its beauty and tranquillity is by trekking through the rocky lands and crossing the streams. Situated in Sanquelim, near the Arvalem/Pandava Caves, the Harvalem Waterfall is one of the most spectacular waterfalls in Goa. Apart from its lush greenery and picturesque surroundings, the nearby Rudreshwar Temple and the Arvalem rock cut caves (featured in the Mahabharat), add to the interest of the Harvalem Waterfalls area. The Harvalem Waterfalls form a lake at the bottom, and the whole scene is so photogenic that it attracts filmmakers and photographers. If you want to explore a unique spot, head over to Valpoi, where you will witness the spectacular Hivre Waterfalls in the middle of dense forest. The unique thing about these falls is the untouched natural beauty of the trail that leads there. Visitors will need to trek and climb through the local village, paddy fields, rocks and streams. The route is tricky, so it’s important to take a local guide. Charavne Waterfall is within Mhadei Wildlife Sanctuary. To reach the falls you need to take a 1.5-2 kilometre trek through small streams, rocks and lush greenery. You can bathe or dip your feet in the water, and feel the refreshing breeze. Near Kuskem village in Canacona district, South Goa, the Kuskem Waterfall is a beautiful place to spend time in nature and dense forest. It can be reached by hiking through the Cotigoa National Park. The Netravali Waterfall is located in Sanguem Taluka, in the Madei Wildlife Sanctuary and Netravali Wildlife Sanctuary, which spreads over 211 square kilometres. The Netravali Waterfall can be reached by trekking through the forest, which is full of the sounds and smells of nature. Also called Kesarval Springs, the Kesarval Falls are situated on the Verna Plateau. They look absolutely spectacular during monsoon, when the rains pour down. Encircled by betel palm plantations and tropical woodlands, the Kesarvall Falls are infused with medicinal properties and are said to be able to cure bodily ailments. It’s popular to bathe here. Coming to these falls after trekking through the Bhagwan Mahavir Wildlife Sanctuary is a spectacular sight. The water flows down from the hill and makes its way through the rocky beds. The 15th century Mahadev Temple (also known as Tambdi Surla Temple) adds to the allure of these falls.